Young men and women ages 11-21 come to live in the youth residential program at Mercy Home in pursuit of a different vision for their lives. They seek a way forward from suffering, desperation and poverty. They seek hope, opportunity, and success. In Mercy Home’s care, they are finally able to focus on school, heal from traumas of the past, feel safe and secure in a home, develop self-control, build healthy relationships, lean on others for support, and cultivate responsibility by holding a job. In short, young people come to live with us to realize their full human potential. The struggles that our young people encounter within their families or their communities are not exclusive to any particular race, geographic region, or economic class. Ranging between 11 and 21 years old, many are middle class and suburban. But most come from troubled inner-city neighborhoods where poverty, violence, gangs and crime are every-day dangers that place extra stresses on families. These stressors can endanger a child’s health and development. 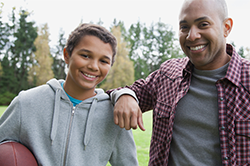 If you are a young person interested in living at Mercy Home for Boys & Girls, Please call 312-738-7590. Though young people come to us largely come from metro Chicago, some also come from other states and countries. Mercy Home accepts children who are referred to us from families, schools, the Department of Children and Family Services and others. Because we are committed to helping every child who comes to us in crisis, we can also assist those who fall outside of our age range or who have challenges that are beyond our scope by offering them an assessment and a referral to an organization that can offer the the help that’s most appropriate for their specific needs. That’s why a call to Mercy Home could save a child’s life, even if that child never comes to live with us. Alyssa couldn’t tell you when she learned what neglect was. It had been happening for as long as she could remember. As she grew up, Alyssa became a loner. She never succeeded at much of anything. She didn’t know she was supposed to. But now, she’s passing all of her classes this semester, and hoping to get even better marks next year. of our kids will show growth, or be at or above grade level, in math and/or reading. youth held 203 total jobs. of our kids matriculated to the next grade level. of our grade eight and grade twelve students graduated.